The chestnut vendor offering hot, charcoal-roasted chestnuts on the streets of many cities symbolizes the coming of winter. This seasonal treat can be enjoyed by a cozy fire at home as well. 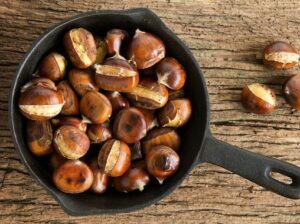 Chestnuts can be roasted in a popcorn basket over an open fire, in a shallow baking dish inside the oven, or in a skillet on top of the range. Recipe contributed by Nikki and David Goldbeck, from American Wholefoods Cuisine. * The first method is preferred, for the charred, crunchy portions that result from the uneven cooking are really part of the appeal. Serves: 4 to 8 1 pound chestnuts in shells To cook chestnuts, the shell must be slit first to prevent bursting. Using a small, sharp paring knife, cut a cross on the flat side of the nut, piercing the shell completely. For fireplace cookery, place nuts in a long-handled basket or popcorn popper without crowding and hold it just above the flame. Shake occasionally so that all sides are exposed to the heat. Be patient and do not put the basket directly in the flame or the outside will char before the inside becomes tender. Chestnuts should cook through in about 15 minutes. When the shells have […] The article Roasted Chestnuts appeared first on VegKitchen.